Feel free to use any or all for your own chiropractic websites. Be sure to check out the video testimonials at the bottom. · Candace Pert, Ph.D - Author of Molecules Of Emotion: The Science Behind Mind-Body Medicine and other great books. · A research study conducted by Drs. Anthony Lauro and Brian Mouch, published in the journal of Chiropractic research and Clinical Investigation, 1991, indicated chiropractic care might improve athletic performance by as much as 16.7% over a two week period. The report also concluded that subluxation-free athletes react faster, coordinate better, execute fine movements with improved accuracy and precision, amounting to an overall better athlete. 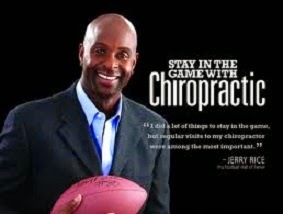 · Jose Canseco - I've found that it's a great stress reliever to get adjusted. It takes away a lot of the tightness in the muscles"
· Greg Mathews - Credits chiropractic with helping him get off the disabled list and overcome a career-threatening slump! · Rick Valente, ESPN's "Body Shaping"
· Joe Montana and 35 of his teammates received chiropractic care right before the 1990 Super Bowl Game. Madonna at 50 years old, even brought her personal Chiropractor along with her on her most recent tour to help her de-stress and prevent injuries. Prior to the tour she is quoted as saying, "It's going to be very draining, and she needs him (her Chiropractor) around to aid in her recovery time after each show," ...an insider tells Life & Style says online gossip column In Case You Didn't Know. Sara Harding- Miss Fitness USA 2006 states, "Basically, I've always believed in chiropractic care. My parents introduced my brothers and myself to chiropractic care when we were very young and it's been an instrumental part of my life. I believe that it allowed me to do gymnastics when I was very little and allowed me to stay in sports and lead a very active lifestyle. I think it's natural to have aches and pains when you bend your body in directions it wasn't necessarily meant to [be bent in], so it makes sense to go to a chiropractor to get my body back in alignment. Ever since I can remember, I've gone to a chiropractor. "